Back in the days we had a hype in the metalscène that’s called nu- metal. Bands like Korn, Limp Bizkikt, Deftones, Slipknot, POD, (HED) pe made a interesting mix between hip hop and metal. These days only the biggest band of those who I just mentioned survived and still play big concerts. Now and than you find a lost band who’s trying to make it in these cruel world. 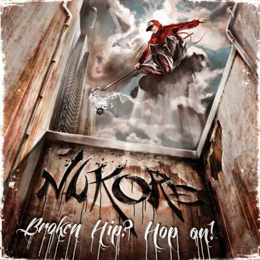 For example Nukore, an alternative metal band from Spain. Founded in 2004 and influenced by all big bans just like Metallica,…. and many more. Their second album Broken? Hip! Hop On! just came out And if you ask me, Nukore is not hip and will be broke in a short time. Damn what kind of music is this. Think at Korn but with a really rap attitude. It’s just not my cup of coffee. Maybe it’s yours but then you should ask your doctor for some strong medications!